We generally worked out Monday – Friday, from around 11pm until 2-3am. Monday was chest, Tuesday was shoulders, Wednesday arms, Thursday was back/legs, and Friday was chest again. We’d switch up some of the exercises within each of those daily groups but having a routine let you know what to be prepared for. It helped you get in the right mindset to do the work. You’re better prepared to tackle the task if you know what it is ahead of time. If you missed a workout, you’d better have a good reason. It’s always easier to simply go home after work or find a million excuses for why you can’t make it but that’s not acceptable. Show up even when you don’t want to. You’ll almost always be glad you did and it’s the only way of making it to your goals. I was never going to be the guy that could bench the most weight. Steve was short but thick and a former power lifter. Jim was tall, a cop and in great shape. Mikey was juicing (at least we always were convinced he was). They could all push around more weight than I could. Still, there were other places I excelled. When it came to shoulder presses, I could throw around more than the rest. And when we went for high reps (20+), I was the clear winner. Just because others are better at some things, doesn’t mean there aren’t other things you’re the best at. At the end of most workouts we had a bit of a cool down before hitting the locker room. Usually it meant doing some ab work and stretching. During this time we frequently talked about what we’d done during the workout and in our personal lives. This time of reflection was great for first clearing the mind and then making yourself more mindful of your experiences and how they impacted you. Goal setting is a must if you want to make it to the next level. When you start lifting, your bench press goal may simply be to do three sets of 10 reps with the bare bar (a men’s Olympic bar weighs 44lbs by itself). From there you have to keep setting goals that grow each time you accomplish the last. If you don’t hit them, you come back next week and try again until you do. Then you set your next goal. All of these can lead up to a larger goal (say 315lbs for 5 reps), but you must set those stepped goals to get there. The reason most give up on working out is that the results don’t come quick. You may lose a bit of water weight at the start, but the real progress is a ways off, and isn’t quick and easy. While many get discouraged, remember that the payoffs do come if you keep working hard at it. It may have taken me over a year to get to a 315lb bench, but I made it. Keep putting in the work, keep setting smaller goals and accomplishing them, and eventually you’ll make it to where you want to be. Building muscle doesn’t just happen from lifting weights. Much of it is about the period of recovery afterwards, and giving your body what it needs to repair and grow your muscles. It’s about the food you give yourself. The sleep you get. All of these things are just important as the actual weight lifting. It’s also critical to make sure you pay attention to the signs your body is sending you. Don’t push it when it needs additional time for healing. While these rules hold true for weight lifting, they also apply to our bodies at work. You may be busy with a project that’s taking all of your time, but you still need to make time to give your body what it needs. The right nutrition, the right rest, and breaks when they’re required. If you don’t, the repercussions (like becoming sick and missing work) will likely set you back further than the time required to make time for your own needs. For a while I was adding 5lbs to my bench each week. For 8 weeks I saw an increase week-over-week. It was awesome. Then I had a week where I wasn’t able to add to my bench. Just because I was able to lift another 5lbs each week previously, didn’t mean it was a given with each coming week. Trends change. You won’t always see improvement after improvement, and that’s OK. It’s fine to take notice and follow trends, but don’t be surprised when they don’t continue forever. And be ready to adjust when they don’t. When I failed to continue adding 5lbs to my lift each week, I got down on myself. I worried I’d hit a plateau and that I wouldn’t be able to continue my great progress. While I was focused on what I failed to do, I didn’t think about the awesome things I had done. I’d increased my bench every week for 2 months straight! I’d added 40lbs to my lift in just 60 days. Most people would kill to be able to see gains like that. It wasn’t until I put the failure aside and focused on the accomplishments that I was able to get my head back in the game and continue to great progress I was making. When I first benched 225lbs it was a huge personal accomplishment. It was a number I was shooting to hit for a long time, it took a lot of work and many little successes to get there. But once the celebration was done, it was time to set a new goal. 315lbs it was. Success is awesome! You hit your goal and you deserve to be happy and recognize it. But once the celebration is done, it’s time to set a new goal and start the process again. If you don’t, you’ll be standing still, while others pass you by. 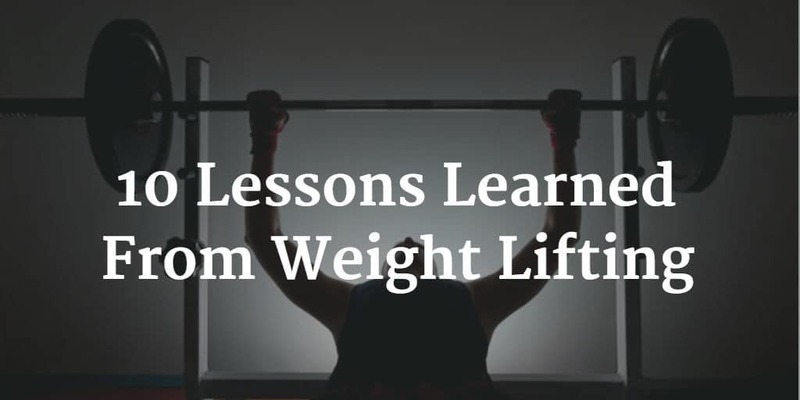 The gym can teach you far more than just how to lift big weights. There are a lot of lessons that can be applied to the rest of your life too. The routine, the discipline, and the hard work involved can all show us how to be better in many of the things we do. Take a look at your hobbies, find the lessons, and apply them to other areas of your life.